This week, we reveal our offensive players of the year from 1A-5A in the entire state on our T.V. show. These players are the best of the best at what they do and they beat out some very tough candidates to win this prestigious honor. If we had to give out 50 trophies to each of the winners, we would but there are so many that you can give out. Throughout the week, we profile the winners on our website and on our Facebook as well as our Twitter pages. At the end of the week, we will put up our honorable mentions for the great players that were also in consideration for these awards. 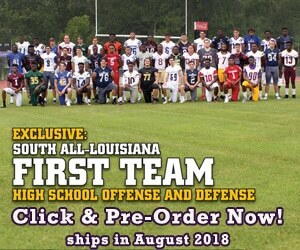 Yesterday, Louisiana Football Magazine revealed the 1A and 2A Offensive Players of the Year in False River QB Damian Johnson and Ouachita Christian QB Grant Fitzhugh! Today, we reveal the 3A C0-Offensive Player of the Year in Jontre Kirklin. Lutcher QB Jontre Kirklin has done something that no other Lutcher quarterback has done in the history of the Bulldog program. He has guided the Lutcher Bulldogs to back to back state championships for the first time in the historic program’s history. Kirklin is one of the best athletes in the state. His ability to escape pressure and make a play out of nothing really helped the Bulldogs prevail in this year’s state championship game against Amite High School. The unbelievable performance by Kirklin wrapped up his marvelous career as a Lutcher Bulldog. In the game, he passed for over 150 yards, ran for over 200 yards, and accounted for four touchdowns to win the game’s Most Outstanding Player. Kirklin may be a defensive back when he gets in college, but there is no doubt that he can win as a quarterback and produce statistically. Out of all the great players to come through the Lutcher football program, he is the all time leader in passing yards (7,605), passing touchdowns (98), and total yards of offense with almost 11,000 yards. He also has 3,000 rushing yards and 51 rushing touchdowns. It could have not been better for the star Lutcher quarterback in his senior year as he accounted for 3,287 yards and 43 touchdowns, led the Bulldogs to two straight state championships, and won our 3A C0-Offensive Player of the Year. Louisiana Football Magazine Editor/T.V. Host Lee Brecheen sees some similarities between his game and a former great defensive back at LSU who also started his high school career as a quarterback. “Jontre Kirklin eminds me a lot of LaRon Landry, who was an All-American safety for the LSU Tigers but also started out as a quarterback for Hahnville High School,” Brecheen said. “Jontre can grow to over 200 pounds and could be a huge star for the LSU Tigers when it is all said and done. Like Landry, Kirklin looks like he is going to make the transition from quarterback to defensive back, but with his athleticism, Jontre Kirklin will definitely make the transition much easier. We caught up with the 3A Co-Offensive Player of the Year as he talked about his Lutcher football career, winning back to back state championships, his teammate winning 3A Defensive Player of the Year, signing with LSU, and so much more in today’s Offensive Player of the Year spotlight! LAFM: What is your vertical, and 40 yard time? LAFM: What are your accomplishments while at Lutcher? I am a two time state champion for Lutcher High School. LAFM: You were named our 3A offensive player of the year. What was your reaction when you heard the news? I really didn’t have a reaction. I just play the game of football. LAFM: You are actually our 2nd Lutcher player to win an award. Lutcher DB Dylan Recotta was our 3A Defensive Player of the Year. What are your thoughts on Dylan as a teammate and a leader? Dylan is a great player, a hard worker, and is very competitive. LAFM: Let’s talk about the season. Lutcher started the new season trying to repeat as well as doing it with a new head coach who came from the team that Lutcher beat in the state championship from the previous season. How difficult was this season compared to your junior season? The season was no different. I felt like the game slowed down a lot and became really easy for me. LAFM: You were coached by Coach Tim Detillier and Coach Dwain Jenkins. What is the difference between them in their approach to the team and how did the team deal with the coaching change? Coach Tim is more of an old school coach. Coach Jenkins keeps everything recent and is more like a brother/father figure to us. LAFM: What is it like playing in two straight state championships and winning them both for a dominant program like Lutcher? I mean it feels great when you win, but after that, it goes back to feeling the same. Just gain more respect. LAFM: Let’s talk about yourself. You played quarterback for mostly your entire career at Lutcher and now you have signed with LSU to play cornerback. How comfortable are you in the adjustment from playing quarterback to defensive back? All I have to do is go in, compete, work hard, and dominate at my position. LAFM: What are some things that you picked up as a quarterback that will help you play on defense at LSU? Mostly, it is where the receivers line up. You can kind of tell what routes they are running, but at times, you really can’t. LAFM: There are a lot of great players including yourself that are graduating, but a team like Lutcher just brings in really good players year in and year out. What is your advice to next year’s Lutcher team in order for them to three peat? Work hard and don’t give up! LAFM: Why should LSU fans be excited to have you on their football team? They are getting a hard worker and a loyal individual. I want to be in the Hall of Fame and go to start my own workout gym. LAFM: Is there anything else that you like to mention that you didn’t get the chance to mention on the awards show? I really don’t know what else to say. They know I am a humble guy.